Dr. Lydia is very good with patients and she's a good doctor. She can treat almost anything. I need to see her when I bonk my head or something. I feel good, better after the treatment. I go see the chiropractor when one of my bones is out of place. After I leave, my bones feel better, more relaxed! My daughter barely spoke for the first 6 years of her life, allowing her twin sister to speak for her. She suffered terrible headaches and was unable to communicate how she was feeling. The numerous doctors I took her to see concluded she must be making it up. After a few visits with Dr. Knutson she spoke more than she had in her entire life. After another round of visits her headaches disappeared completely and she blossomed. Her teacher said she was a different child. It's been five years and she hasn't stopped talking since! After our second visit with Dr. Knutson in the beautiful Lydian Center. I asked my son Cameron, now almost 10, "How did you like working with Dr. Knutson today?" His answer, " I feel like I knew her before we even met her." The connection they made was wonderful and a huge part of what made the treatments so successful. We are thankful to have Dr. Knutson in our lives. I got an awful manipulative machine stuck in my mouth [palate expander] by the dentist. I couldn't go to sleep at night. Dr. Knutson treated me and I could sleep at night. She's gentle and a good chiropractor! My 17 month old daughter had a severe croup. She was restless and miserable. I brought her to see Dr. Knutson who gave her a gentle chiropractic treatment. The day after, the croup was gone! She made her feel so much better, look at her picture she is smiling! I recommend to any mother that is really tired of running to the doctor every week to visit Dr. Lydia, she can make a difference. Before working with Dr. Knutson, I had no idea what it felt like to have my grown body function optimally, having moved through the world lopsided, repeatedly compensating for this or that injury. After my initial treatments, I stood taller, felt so much stronger, and experienced a sense of balance that transcended the physical. I am thrilled to have found Lydian Chiropractic. I am a professional ballet dancer and acutely aware of my body as an integrated system. I first came to the Lydian Center after completely tearing my ACL. I was scheduled to have surgery in a week and wanted to connect with the chiropractors beforehand. Their analysis was spot-on and explained so many things I had felt for years. I've seen them regularly as a part of my rehabilitation and feel like I'm getting an entirely new instrument. Deep-seated injuries and imbalances are being corrected and my knee is healing well. I'm really looking forward to dancing again! The chiropractors at Lydian Chiropractic are true healers! So many times I've walked into their office hunched over in pain and walk out upright and pain free. In addition, they have also been a huge help to my life as a trumpet player. After a number of visits my breathing capacity improved and I gained three or four notes at the top of my register - the first time in my life I ever hit a "high F" was after being in her care. They are the best! A severe head injury left me unable to work or even focus my eyes for almost a year. During that time, I went from doctor to doctor and took one test after another. Eventually the doctors concluded there was nothing physically wrong with me and that I would need to be on pain medications and unable to work for the rest of my life. Lydia Knutson completely turned everything around. After one visit she had identified the underlying cause of all of my symptoms, and within three weeks she had restored my vision, alleviated all pain, and rendered me able to return to work. Thanks to Dr. Knutson I have my career, and more importantly, my whole life back. I had tried nearly every approach to resolving my severe lower back pain including physical therapy, cortisone injections, acupuncture, cranio-sacral therapy, reiki, and various chiropractors. Some of these treatments gave me temporary pain relief, but nothing "fixed" the source of my pain until I began to see Dr. Lydia Knutson. I have now had five years largely pain free and when I do have an episode of pain she is able to correct it with a few treatments. I have such confidence in her ability to fix my back that I willingly drive two hours from my home in Western Massachusetts to see her. Thanks for everything! I am an active athlete and play basketball with teenagers every day as part of my job. For the past 10 years, Dr. Knutson has consistently healed chronic ailments and sports related injuries that other medical specialists told me couldn't be repaired without surgery. Dr. Knutson's chiropractic techniques are designed to accurately identify and treat the root of the problem. From structural adjustments to allergies and sugar overdoses, Dr. Knutson will pinpoint the cause of pain and correct it. I always leave her office feeling refreshed and balanced. She is so good at understanding the body that I use her as if she were my primary care physician. And, because of her creative approach to therapy, her positive attitude, and the effectiveness of her methods, over the years we have built the type of trust that you can't find in American medicine today. She really is one of a kind in the Boston area – but I have even recommended her to friends who live out of state. As a very busy violin teacher I am routinely exposed to the coughing and sneezing of the young children I teach. Whenever I feel the achy or feverish beginnings of an illness, I get a treatment at Lydian Chiropractic to boost my immune system. With their help, I always feel better within hours and avoid getting sick and missing work. They're miracle workers! 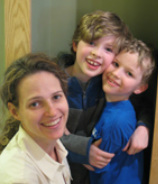 Dr. Lydia Knutson is an outstanding chiropractic professional! For years and years I suffered low back pain. After a series of treatments with her my back is now the least of my worries! A few weeks ago I fell on the ice and injured my ribs. Sleeping was difficult and breathing was painful. After four treatments all the pain was gone and I'm back to sleeping well. The brilliance of Axial Stability Method is its capacity to restore body balance and eliminate pain through external treatment of the nervous system. Dr. Knutson not only does this extremely well but she's very knowledgeable about body chemistry, nutritional concerns, and what supplements will substantially help the healing process. She's an excellent practitioner and a joy to work with! I've been seeing Dr. Knutson since 2003 for various injuries. I am a busy professional musician and an enthusiastic ice skater. She is an essential part of my health team for keeping me in shape. Recently I broke my right wrist. It didn't heal well and I was in pain while playing. After several chiropractic treatments, my wrist pain is significantly reduced, my range of motion much improved and I am happily playing the oboe again! Thank you! After Dr. Lydia Knutson completely cured my husband’s persistent low back pain in just four weeks I decided to schedule an appointment for myself. I wanted help with my bad posture and painful foot problem, which I had been told for years were genetic and unsolvable except by surgery. Dr. Knutson's chiropractic therapy "reset" my body within weeks. All my foot pain was gone and I felt and stood straighter! I went back to see her after a terrible fall off a unicycle, straight onto my tailbone. "The pain will go away" - I thought, as we all do when something is not bad enough to call an ambulance. But I didn’t get better: walking, bending and carrying anything was getting extremely uncomfortable day after day. I had never had problems with my low back! I came to Dr. Knutson's office again. After five appointments within two weeks, I felt as if the accident had never happened. Treatments at Lydian Chiropractic and their results are a source of physical and psychological strength and a real joy!